Hope's Cafe: Uncover Exciting History Book Review and Giveaway! Uncover Exciting History Book Review and Giveaway! For any homeschoolers out there-or even if you don't homeschool, but want some good books for your kids to read-here's a great book I recommend! It's called Uncover Exciting History, by Amy Puetz. This is a really neat book "Revealing America’s Christian Heritage in Short, Easy-to-Read Nuggets. What is history anyway? It is the story of real people who did real things. For history to be fun for everyone (even those who think they hate history), it must go beyond hard facts and meaningless dates to the real people who made the significant events happen. People like George Washington, who bravely crossed the partly frozen Delaware River to attack the British at Trenton. Stories like that of the bold Americans who bravely fought against the Barbary pirates during the little-known Barbary War show how interesting history is." It's aimed more at kids, but I have to admit, I read and enjoyed the book too! I love history, and this has some of my favorite history "stories" in it-Sgt. Alvin York, the Story of the Constitution (every American child should learn about this! ), the Great Awakening, and the Civil War (Gen. Robert E. Lee is one of my favorite historical characters!). This book has 25 chapters, each detailing a different event or person in American history. And, it has 4 bonus chapters! It is so important for children to learn the true history of America, as most people nowadays seem to not even know (or care) about our Christian heritage. 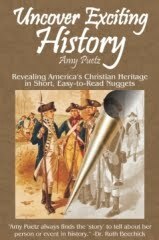 "Amy Puetz is a homeschool graduate and servant of Christ. In 2001 she earned a degree as a computer graphic designer and began A to Z Designs. Over the years she has made t-shirts, cards, and books that reflect her passion for Christ and her love for history. Because of a chronic illness (fibromyalgia) she has developed an online business that will allow her to work from home. Her other interests are writing for her column in HomeSchool Enrichment Magazine, doing contract design work for others, and creating historical costumes. To read an article that she wrote for the Homeschoolers of Wyoming newsletter click here. She works with the Wyoming state organization as a layout designer for the newsletter." Amy has graciously offered a copy of "Uncover Exciting History" to one of my readers! I know you will love this book! Go to Amy's store and tell me another product you'd like to get! 5 Entries-Make a purchase from Amy's store. Leave 5 comments telling me you did. Note:I can and will check with Amy to make sure you really purchased products, so please be honest about this! This giveaway ends Tuesday, June 29, 2010 at 11:59 p.m. Please leave a valid email address in each comment, as this is how the winner will be notified. Winner will have 48 hours to respond, or another winner will be chosen. Giveaway open to US residents only. Disclaimer:I received product for the purpose of review. All thoughts and opinions are mine. All quotes taken from the AmyPuetz.com website. I would also like to have the Pioneer Cooking e-book! I would like the Wagon Wheels West coloring book. I entered the HeavenScent soy candle gift certificate giveaway! I entered the Turkish Towel company giveaway! I would like to read 'Come And Get It'. The Countdown to Christmas Printed Book looks interesting! I like the Little Women Costumes. I like Amy's Store, and would like her Countdown to Easter ebook as well. I follow hopes cafe publicly. I also entered your ShatoBe Shaper giveaway. Thank you for hosting both of these giveaways, fantastic!